Seven Steps to Beauty for a Girl Named Avarice, Nightmare, February 2018 . Read an interview about the story here. 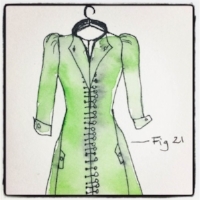 The Emerald Coat and Other Wishes, Interfictions: A Journal of Interstitial Arts, May 2015. Long-listed for John Joseph Adams' Best American Science Fiction and Fantasy 2016. Reprint forthcoming in Lightspeed. The Enchantment, SmokeLong Quarterly, November 2016. Evangeline and the Forbidden Lighthouse, Interzone, May 2017. Glasswort, Ice, Lackington's, May 2017. Not the Grand Duke's Dancer, The Dark, August 2014. The Lily Rose, The Dark, February 2017. Listen to the podcast here. The Wartime Diary of Fieke Brand, Age 15, Steampunk Universe, January 2018.. Speaking to Skull Kings, Betwixt, July 2014. Reprinted as a podcast in Cast of Wonders, April 2015. The Ghosts of Blackwell, Maine, Urban Fantasy Magazine, December 2015. Hungry Ghosts, Black Static, March 2015. Honorable Mention (Long List) in Ellen Datlow’s Best Horror of the Year Volume 8. A Guide to Etiquette and Comportment for the Sisters of Henley House, Chiral Mad 2, December 2013. Honorable Mention (Long List) in Ellen Datlow’s Best Horror of the Year Volume 6. Victoria's One-Way Ticket, Kaleidotrope, October 2014. The Firebird, Steampunk World, August 2014. The Desert Cold Oasis and Spa, The Colored Lens, Winter 2013. Abena and the Bride-Mad Sorcerer, Ember: A Journal of Luminous Things, May 2015. The Rondelium Girl of Rue Marseilles, Qualia Nous, Aug. 2014. Honorable Mention (Long List) in Ellen Datlow’s Best Horror of the Year Volume 7. The City Dreams of Bird-Men, Fantasy Scroll Magazine, February 2015. Listen to the podcast here. Blood-Red Oxfords, Size 39. Runner-up in The Reader Berlin’s 2014 short story competition, now available in the Streets of Berlin anthology. The Black Crow of Boddinstraße, Chiral Mad 3, March 2016.